Michael Franti, whose latest CD release All Rebel Rockers marked the highest debut album chart position of his career and gave way to the platinum digital smash, “Say Hey (I Love You)”, is now a part of the EMI/Capitol Records roster. New singles will be released later this month from Franti’s forthcoming CD, The Sound of Sunshine on the Capitol Records/Boo Boo Wax label. The Sound of Sunshine album will be available later this summer. Greg Thompson, EMI’s EVP of Promotion and Marketing, said, “We are honored to be involved with such a gifted artist whose incredible spirit, coupled with his musical genius, makes him one of the most exciting performers and musicians in the music scene today. Michael Franti is the creator and lead singer of Michael Franti & Spearhead. 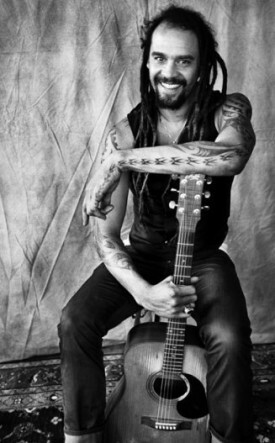 For over two decades, The Bay Area born Franti has been bringing our world exceptionally powerful, deeply felt music. While studying at the University of San Francisco, Franti formed the punk band The Beatnigs, and later the far more hip hop-inflected The Disposable Heroes of Hiphoprisy. In the mid-Nineties, Franti first formed Spearhead, and increasingly in recent years, he’s found his own voice musically and his own organic brand of popular success. Franti’s impressive series of recordings have vividly reflected his status as a musical citizen of the world. Franti & Spearhead will kick off a nationwide headline tour on May 14th at The Fillmore in Miami. For tour dates and ticket information and official Michael Franti news and to check out the latest v-blogs on FranTiV, go to www.michaelfranti.com.